Citing a 110-percent jump in digital book sales in Latin America and 41 percent digital growth in Spain, a new report sees digital as a key to the Spanish markets’ turnaround. A new report indicates that in 2016, Latin American publishers saw an upturn of digital sales growth, year over year, of 110 percent–and their Spanish counterparts saw a 41-percent jump. 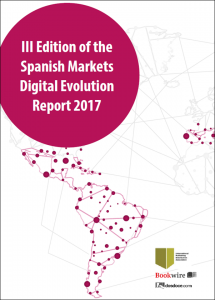 This report, the Spanish Markets Digital Evolution Report 2017, becomes available for download today (May 30) and is being released by the Madrid-based consultancy Dosdoce.com and ebook distribution platform Bookwire. In this joint white paper—produced from the third annual report of this kind—the team led by Dosdoce’s Javier Celaya and Bookwire’s Jens Klingelhöfer is working with more than 200 imprints in Latin America and Spain and is charting what Celaya characterizes in comments to Publishing Perspectives as “impressive, ongoing digital growth in the Spanish markets.” Celaya serves as managing director for Bookwire’s Spain and Latin American operations. Many publishing players from the English-language markets arriving for this week’s BEA trade show at the Jacob Javits Center won’t miss the irony of this apparently buoyant moment for digital action in the Spanish-language markets: in the US and UK markets, the debate centers around what some describe as a digital decline, especially in ebooks. In fact, Celaya and Klingelhöfer’s teams see digital sales reaching a double-digit share of Spain’s book market for 2016 once the Spanish Publishers Association–the Federación de Gremios de Editores de España–has finished putting together its figures for last year. 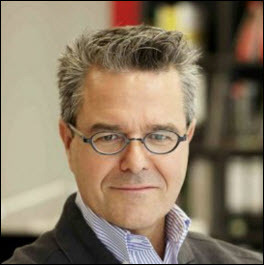 “Some developments and results,” Klingelhöfer tells Publishing Perspectives, “took more time and effort than expected. “But we see the market growing significantly for our publishers this year with a very positive outlook for the coming years. Those who have watched with concern as Spain’s publishers struggled with economic challenges will be glad to read, “Forty-nine percent of the ebooks published in Spain were sold on the Spanish domestic market in 2016 compared to 45 percent in 2015. In fact, according to Celaya, his sources suggest that ebook sales last year including trade, academic and self-publishing, are floating all boats: they may well have reached between 8 and 10 percent of total sales in 2016 in Spain, up from 5 percent of overall sales in 2015. 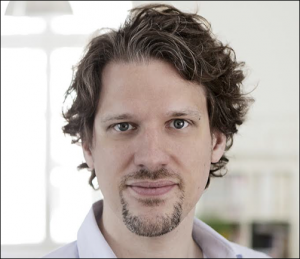 What’s more, he says, “self-publishing in the Spanish markets is valued at €8 million (US$8.9 million), which represents around 5 to 7 percent of total trade ebook sales. Key market-driving sectors are academic and/or educational content, as well as trade ebooks, according to the report. Export is a key here, the border-crossing nature of digitization making it possible for Spanish-language content providers and consumers to find and support each other readily. 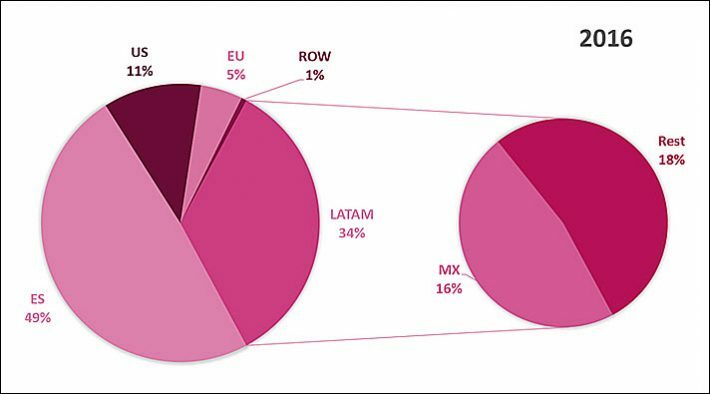 The majority of the Spanish publishers, according to the white paper, report that 51 percent of their digital sales in 2016 were made internationally as digital exports. “Mexico takes the lead in sales of digital content published by independent Spanish publishers,” Celaya says, accounting for 16 percent of the country-by-country breakdown. Otherwise, he says, independent publishers’ best showings in digital are in Argentina, Colombia, and Chile. “Amazon launches a large number of campaigns to promote new releases. Independent publishers offer far fewer new releases per year than major publishers. “Amazon launches various campaigns offering large discounts. 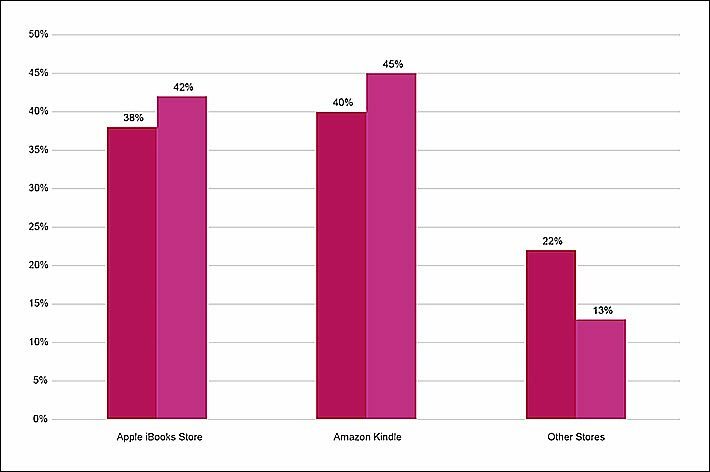 Independent publishers are more reluctant to offer big discounts on their ebooks since their titles usually have a longer lifespan–backlist–than those offered by major publishers. Among other things, the Dosdoce/Bookwire report indicates that higher prices are viable in the US market than in Spanish-language countries. 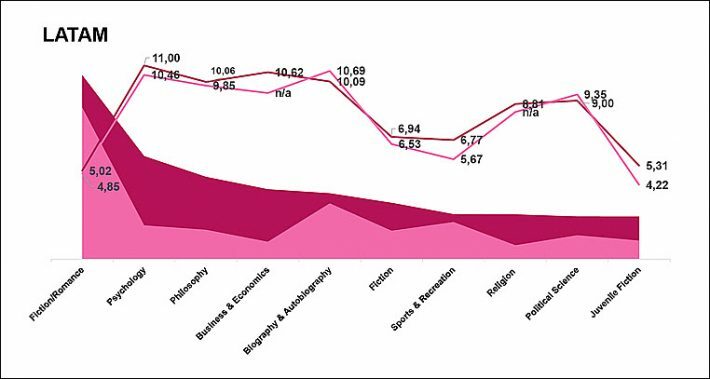 “The average price of a fiction ebook in Spain” according to the report, “is 5,89 euros (US$6.60), whereas that same category in the USA reached an average price of €5.09 and in Latin American it peaked at 5,94 euros. As Celaya notes, the key growth range of ebook sales in the Spanish markets falls between €4.99 and €9.99. The Spanish Markets Digital Evolution Report 2017 on which the Dosdoce-Bookwire white paper is based has been created for the International Digital Distributors Meeting to be held June 7 and 8 at Casa del Lector, Madrid, with speakers from China, the UK, the USA, Germany, Sweden, Italy, and Spain.